Most Georgia counties (at least Atlanta suburbs) currently follow the International Residential Codes (IRC). Railings are now required, by most counties, for any potential fall greater than 30 inches. New homes will not be granted a certificate of occupancy without them. And other permitted work (ex. new deck, retaining wall etc.) will not receive final approval until fall protection is in place. IRC codes require a railing no less than 36" tall for any potential fall greater than 30". This applies to any potential fall whether from a porch, patio, deck, walkway, or retaining wall. Furthermore, the railing must be constructed as to prevent a 4" sphere from passing through any portion including between the bottom rail and walking surface. The current code was adopted by most counties in the last 5-6 years. Many homes built prior to 2006 included porches, patios, and retaining walls that had no railing or barrier even though they exceeded the 30" rule. Some exceed limits by more than 10 feet; a serious risk of major injury. These homes are not required to add railing unless other permitted and inspected work, like a remodel,is taking place. But if the potential fall presents possibly catastrophic injury, it's a good idea to have them (whether you choose wrought iron or wood). Some ornamental elements, especially certain scrolls, will not meet code requirement unless additional parts are added to satisfy the 4" rule or a split rail is added to meet the 36" rule. You need an expert designing your rails. The last thing you want is to pay your railing contractor then be denied the Certificate of Occupancy (C.O.) because they didn't account for large openings. At Mind's Eye Fabrication, we have the experience and skill to determine if your selected design will satisfy code requirements. Often we can suggest minor adjustments that retain the appearance and satisfy code. Sometimes homeowners are required by their Home Owner Associations (HOA's) to get approval before installation. Depending on the neighborhood and the HOA the process can range from a verbal telephone discussion, to the submission of design drawings. Regardless of the process, we've done it enough to help you through it. If your HOA allows it, we'll take care of all communications so it's seamless to you. Some HOA's will not allow a third party to submit requests (ex. contracted HOA management companies as opposed to self-governed neighborhood HOA's). In those cases, we can provide the samples and drawings but they require the submission to come from you. In any event, we'll make the process as easy as we can. Recently, we've seen a trend in homeowner insurance companies requiring their policy holders to retrofit railing or be cancelled. It's not known, yet, to what extent this trend will continue. But if you get a random call from your home owner insurance company requiring you to install handrails, give us a call. We can help find out their specific requirements for your situation. Sometimes, a single round handrail on one side will suffice instead of a balustrade style on both sides. It can be a tricky process. We'll get you through it. Many homes, built prior to code adoption (pre-2006), are not up to current regulations. The county doesn't require you to retrofit your home for railings (unless other permitted work is being performed). But, during the sale of a home most home inspectors include the recommendation for the addition of rails, where applicable, on their reports. 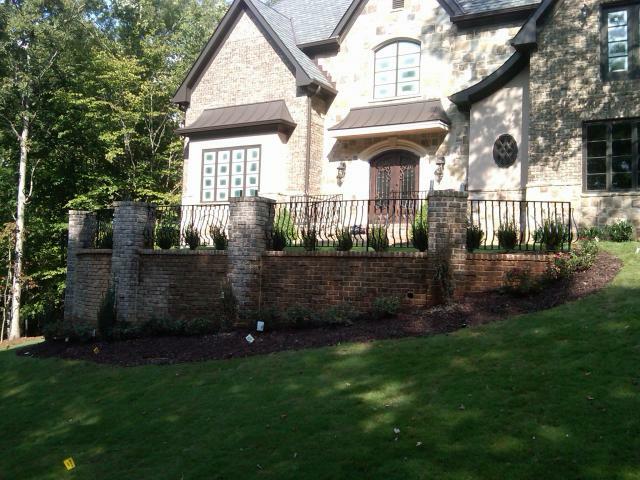 Wrought iron rails meet the requirement for safety while adding distinctive curb appeal. Some customers want hand rails for their own safety. Others would rather not have them but are required by a building code inspector or private home inspector. 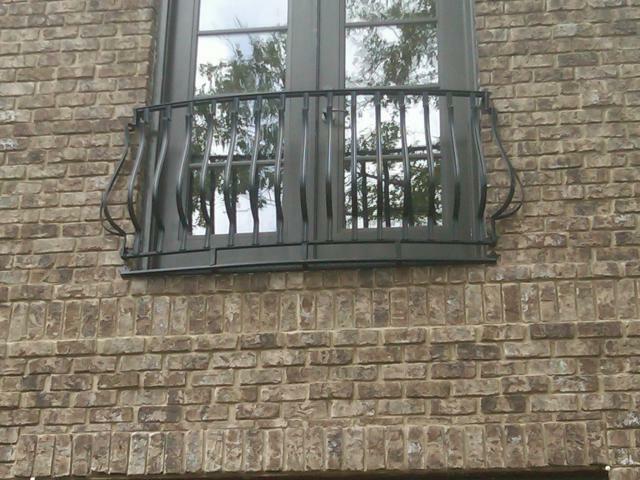 Even our customers that didn't want railing are pleasantly surprised at how unobtrusive wrought iron rails are. Many customers replace the wood rails on their back deck with wrought iron hand rails because it opens the view while sitting on the deck. Many Atlanta suburb counties (Gwinnett, Cobb, Dekalb, Fulton Forsyth etc.) require that homeowners install a fence around their pool to keep wandering children out. Codes for pool fences vary more by county than the codes for handrail. Most differences relate to the overall height of the fence, the height of the gate latch, and accommodations for any climbable structures nearby. to celebrate our 10th year in business and to thank our customers and our community, we're offering a special 10% discount.